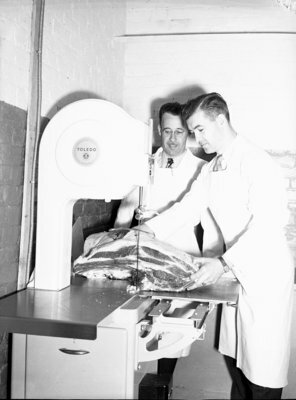 Black and white negative showing Ronald Agg (left) and Bud Dilling demonstrating the new Toledo meat saw for Agg Bros. Grocery Store. Ronald W. Agg (1906-1985) and his brother Lawrence D. Agg were grocers. Their first grocery store was started at Dundas Street West. Later, they moved to a larger building on Brock Street North. Ron Agg enlisted in the Canadian Armed Forces in 1942 and went overseas with the Royal Canadian Army Medical Corps. In 1945 Ron returned and resumed work in the grocery business. He continued to operate Ronald W. Agg Groceries, Meats and Fruits until selling the business and building in 1954 to the Stroud Fruit Company of Oshawa. Ronald Agg subsequently worked with Gordon Osborne Realty and the Whitby Public Utilities Commission. He was a devoted member of All Saints' Anglican Church and served as member of the choir, treasurer and rector's warden. He was a director of the Whitby Chamber of Commerce, member of the Whitby Public Library Board, charter member and past president of the Whitby Kinsmen Club and was also a member of the Royal Canadian Legion. Agg Brothers Meat Saw, 1948, Marjorie Ruddy, Whitby Archives, 02-000-040.